Green eyes look amazing when they’re enhanced by a smokey eye. A smokey eye creates sultry effect that can make you look even more beautiful. Smokey eyed make up uses dark eye shadows and blending techniques to achieve the ideal smokey effect. It can really draw attention to the eyes and create dramatic definition. The easiest way to create the perfect smokey eye is to use a few different shades of color – dark, medium and light. This is to create a dynamic, gradient effect instead of a flat block of color on the eyelid. Volumizing mascara and black eyeliner are the icing on the cake and can be the difference between an average smokey eye and a spectacular one. When choosing the color to best compliment your eye color, take a look at a color wheel. It’s basically a circle with different color sections that represent the relationship between colors. You probably remember learning about primary colors, secondary colors and tertiary colors in art class. But if not, here’s a crash course. Primary colors are red, blue and yellow. Secondary colors are the hues that you get when you mix primary colors – violet, green and orange. Tertiary colors are the colors in between secondary colors, such as red-orange, yellow-green, blue-violet, etc. Certain colors “complement” each other, which really means that they are opposites. Opposite colors make each other really stand out next to each other. Green eyes look amazing with purples, roses and mauves. These colors are complementary to the color green and will immediately make your eye color pop. However, you’ll want to avoid pinks and reds that are also opposite green on the color wheel because they can make you look sick. Choose eye shadows that have warm tones to contrast nicely with the cool tone of your green eyes. Step one to the best smokey eye is priming your eyelid first. Eye shadow primers create the perfect base for eye shadow to adhere to. It makes your makeup longer lasting and will keep it from getting annoyingly trapped in your crease because of excess oils. After you’ve created a smooth surface, don’t forget to use concealer to cover up any dark circles you might have. Once the eyelid had been primed, it’s time to start your smokey eye. Outline your eye with black eyeliner. Use your liner on the upper and lower lash line, but avoid completely enclosing the eye because that will make it appear smaller. Highlighting your brow bone and the inner corner of your eye makes your eyes appear larger and brighter. 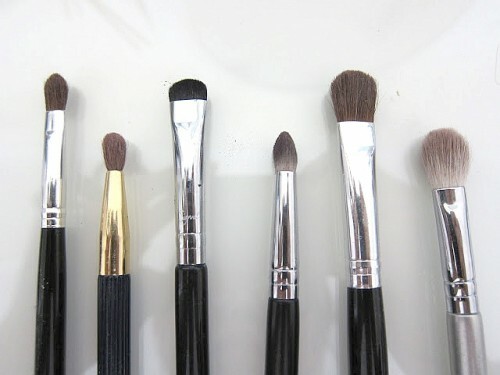 Use a small brush to apply a light beige or white for the best effect. Highlighting around the eye is essential to create contrast for the smokey eye. The color you choose as your accent color will be the main focal point of the smokey eye. 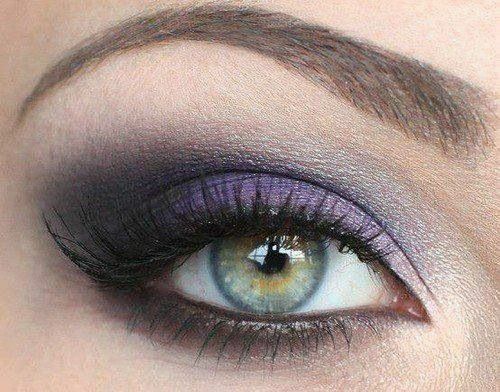 For your green eyes, use a rich purple with red undertones to make them really pop. 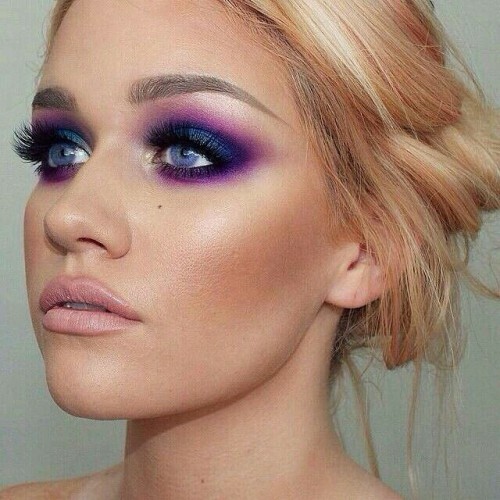 Make sure the purple is dark enough to stand out against the highlight color while also being light enough to contrast with your darkest color. With an eye shadow brush, apply your purple eye shadow from the inner corner of the eye to ¾ of the way up the lid. Define your smokey eye by apply black shadow closest to the lash line and outer corners your eyelid. This gives the darkest hue to your smokey eye. Make sure you blend any obvious lines in between your defining color and your accent color. Use a medium shade to blend out your accent color in the final 1/4 of your eyelid up into the highlight color. Don’t be too precise, a smudgy imperfect design is what makes this look work. Ultimately, this is what makes the makeup look smokey. Long and thick lashes are the perfect addition to a smokey eye. Use 1-2 coats of mascara after you curl your lashes. I LOVE THE COLORS!!! I can’t believe I found COLORS for when I go to the rockin’ party’s. I am really glad that you enjoyed these pictures, Ashley! This is one of my favorite looks for eyes! Agreed–the writer did a great job of finding images that work well for this makeup trick.